Having passion in drawing since his childhood, Muhammad Hazimi Asyraf Rusli is still in persistence in expanding his talents in this art although he is studying in a different field. Hazimi is currently a fourth year student of Bachelor Degree (Hons) in Industrial Chemistry Technology, Faculty of Science and Technology (FST) and he is undergoing a practical industry at the Department of Chemistry (Kelantan branch). 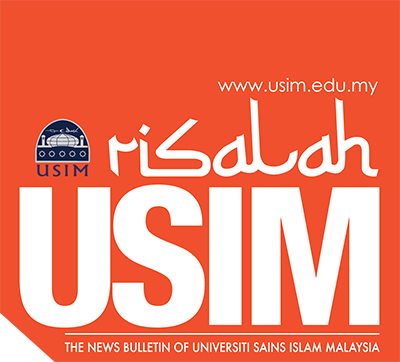 “I have been active in the art of khat during my second year of studies in USIM after viewing some of my friends’ collections on the social media. One the arts of khat that I like is diwani jali, as the handwriting is very unique and it appears in different forms”. “It is not easy to acquire this skill, though, as it takes a period of time for you to master the skills to learn the arts, rectify your errors and gain comments from others who have expertise in this field about your artwork”, explained Hazimi. “I can see that this type of art is less favoured by youngsters nowadays compared to other types of arts. In fact, this art is very special as it has its own aesthetical values, and it is an ancient art. If it is not revived, the younger generation will definitely forget about it”, he said. He is planning to expand his art products (not limited to on paper only) such as shirt, keychain/button badge, smartphone casing, wedding card and others. He also hopes that one day, he can have his own brand on this art. “If my career opportunity is in the field of Science, I will be happy to accept it, as I regard that as a service to the community”, Hazimi said, admitting that he is not a choosy person when it comes to his future career. He has successfully produced more than 100 artworks and he consistently receives orders from all over the country.